With MyGuardian 11 and MyGuardian 11 + OBD solution you can check the status of your vehicle by live tracking your fleet 24×7 on Real Time or On Demand basis through our robust and sturdy device. Eventually the map can be checked at the same time for the position of each vehicle, so that you can have the control of the entire fleet with just a glance! 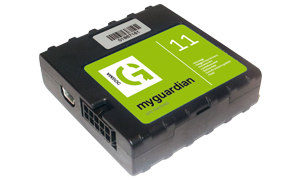 For those, who wish to have the control on their fleet at any time of the day, MyGuardian 11 and MyGuardian 11 + OBD is the best solution for them. Even when the vehicle is in motion, data can be sent at high frequency to you with only a few minutes of delay. Scenario: If you are a Fleet Manager of your company and does the routing for all the staff, safety of all the employees is always on top of your priority list. But there is a vital question. How would you ensure that the car driver is taking the vehicle in right direction? How would you monitor that your employees are safe and will reach home on time? To ensure the safety of your staff, use MyGuardian 11 or MyGuardian 11 + OBD GPS Tracking solution in your fleet and monitor the position of the vehicle by its Real Time Tracker feature. All just with a click on the software. Scenario: If you are a Logistics manager of a Car Manufacturing company, your vehicles are ready for delivery. But what if the driver tries to take the vehicle to some unwanted place. If any of your vehicle is theft, you will be in great loss. But nothing to worry, there is a way out. With the Real Time Tracker of our MyGuardian 11 or MyGuardian 11 + OBD GPS Tracking solution you can know all the positions where the vehicle moved or stopped and for long, ensuring safe delivery.